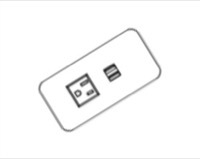 TodayÍs business environment demands flexibility and timely access to data and charging ports for USB devices. With convenient, quick-access to electrical power, data ports, video ( HDMI / VGA) connections, and audio jacks your clients and business associates will be connected and energized for whatever challenges the day may bring them. With our advanced Power & Technology Modules you can modify your existing tables to get fully-featured conference and meeting tables for the board room, meeting room, conference center, or the corner office. The ACT IV is the newest edition to our Tabletop family of power and data units. It is designed to fit into the same footprint as the ACT, however, its power capabilities have doubled to include four power. The ACT IV is the newest edition to our Tabletop family of power and data units. It is designed to fit into the same footprint as the ACT, however, its power capabilities have doubled to include four power. The ACT I TT is the newest edition to our Tabletop family of power and data units. It has 4 power receptacles, 15 AMP circuit breaker and cutouts for 4 Telecom Plates.. The ACT II TT is the newest edition to our Tabletop family of power and data units. This double-sided unit has 8 power receptacles, 15 AMP circuit breaker and cutouts for 8 Telecom Plates. The ACT G2 is a simple solution ideal for small conference areas and meeting rooms. It seamlessly replaces the popular Interact series with the addition of new and improved features. ACT G2 provides power, data and USB charging accessible at the table top with an additional convenience outlet located underneath for added utility power. The Interface G2 is an ideal solution for large conference tables and meeting spaces. It seamlessly replaces the Interface Series with new and improved features that fit the same cutout size. Packed with four power and three telecom plate cutouts, the Interface G2 is available in configurations both with and without USB to satisfy all your connectivity needs. The ACT IV G2 is the newest edition to our Tabletop family of power and data units. It is designed to fit into the same footprint as the ACT, however, its power capabilities have doubled to include four power. The ACT - HDMI Video Switch is a collaborative video conferencing solution that combines power with the necessary audiovisual components required to foster collaborative meeting environments between teams working together on site or connecting those associates working remotely. The ACT - Portable HDMI Video Switch is a collaborative video conferencing solution that combines power with the necessary audiovisual components required to foster collaborative meeting environments between teams working together on site or connecting those associates working remotely. The ACT - Seclude is the newest edition to our Tabletop family of power and data units. 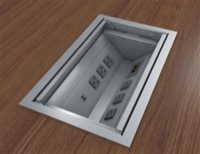 This surface mount or under table mount unit has 1 power receptacles, and 1 RJ45 Cat 6 Data Jacks. PM-DASH is so smooth... it's positively seamless. With a solid faceplate construction and a simple block profile, PM-DASH is charged with clean, modern energy. 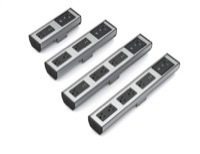 These power modules mount easily to the edge of your work surface, and is perfect for charging your desktop devices. 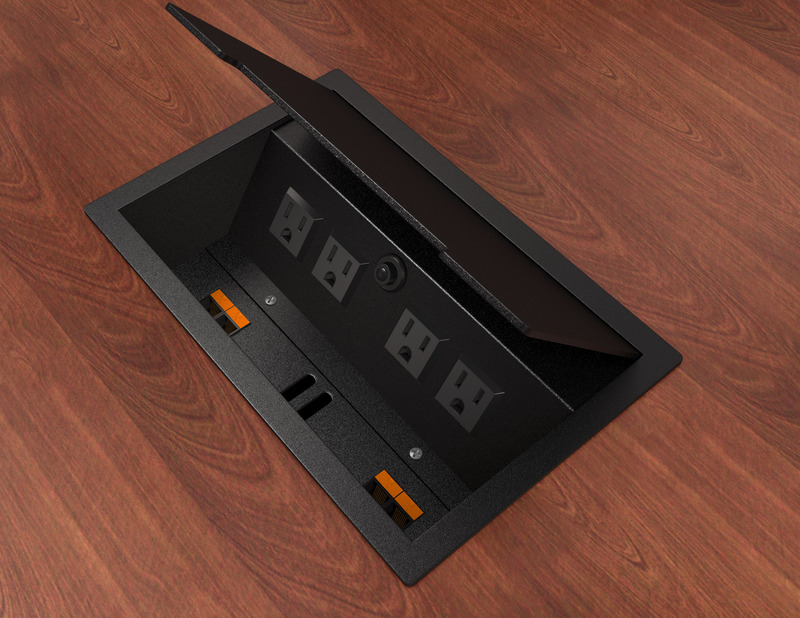 The Island Hub is a unique distributed power solution that is aligned with one of the fundamental principles of collaborative work spaces, flexibility. The ACT - Seclude is the newest edition to our Tabletop family of power and data units. 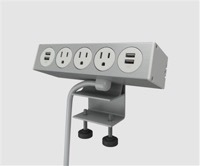 This surface mount or under table mount unit has 2 power receptacles and 2 RJ45 Cat 6 Data Jacks. The ACT - Seclude is the newest edition to our Tabletop family of power and data units. This surface mount or under table mount unit has 3 power receptacles, 15 AMP circuit breaker and cutouts for 1 Telecom Plate. The ACT - Seclude is the newest edition to our Tabletop family of power and data units. 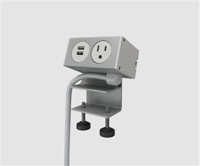 This surface mount or under table mount unit has 3 power receptacles, 2 USB Charging Connections, and 1 Open Telecom Plate. The ACT - Seclude is the newest edition to our Tabletop family of power and data units. This surface mount or under table mount unit has 4 power receptacles, 15 AMP circuit breaker and cutouts for 1 Telecom Plate. The ACT - Seclude is the newest edition to our Tabletop family of power and data units. 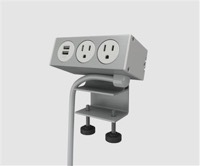 This surface mount or under table mount unit has 4 power receptacles, 4 USB Charging Connections, 15 AMP circuit breaker and 1 Open Telecom Plate. The simple and stylish PM-DOT is perfect for charging your laptop, phone, tablet or other devices and is easily mounted to your worksurface. Attaching the PM-DOT to your desktop or benching system requires no cutouts and no installation. The ACT - Seclude is the newest edition to our Tabletop family of power and data units. 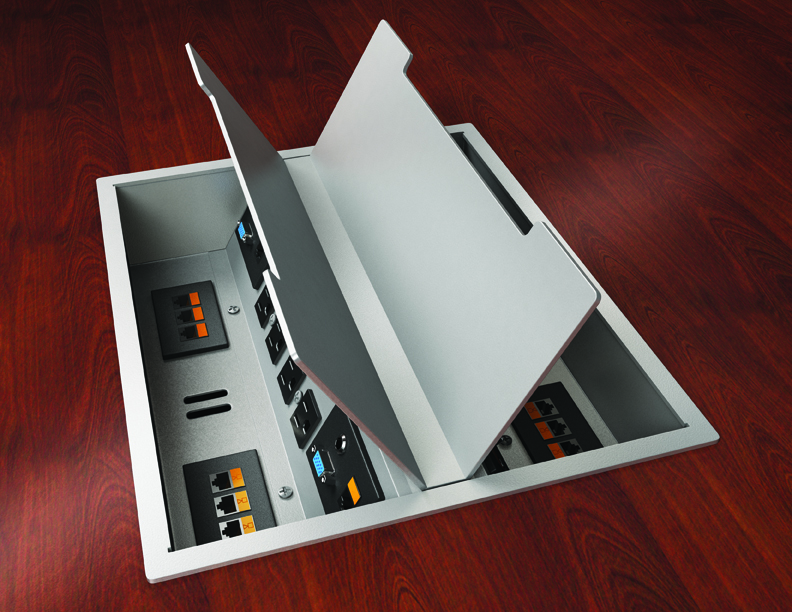 This surface mount or under table mount unit has 1 power receptacles, and 1 RJ45 Cat 6 Data Jacks. The ACT - Seclude is the newest edition to our Tabletop family of power and data units. 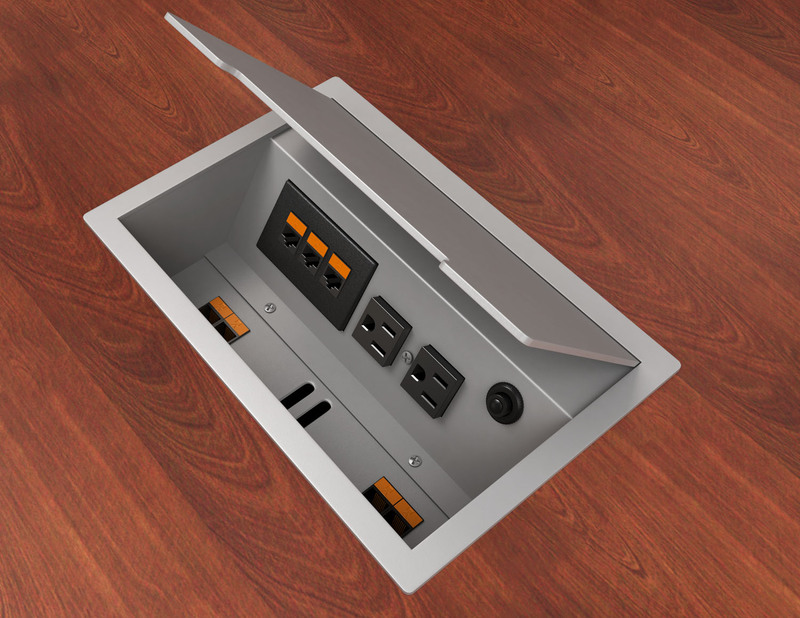 This surface mount or under table mount unit has 1 power receptacles, and 1 RJ45 Cat 6 Data Jacks. The simple and stylish PM-DOT is perfect for charging your laptop, phone, tablet or other devices and is easily mounted to your worksurface. Attaching the PM-DOT to your desktop or benching system requires no cutouts and no installation. The simple and stylish PM-DOT is perfect for charging your laptop, phone, tablet or other devices and is easily mounted to your worksurface. 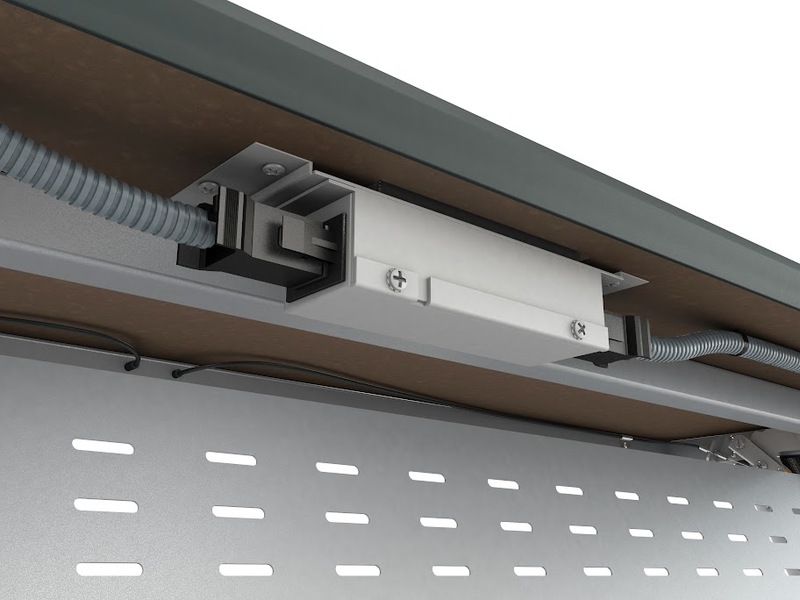 Attaching the PM-DOT to your desktop or benching system requires no cutouts and no installation. The ACT-V is now available with 2.1 Amp USB charging ports so you never have to be without your favorite devices! The ACT - Seclude is the newest edition to our Tabletop family of power and data units. 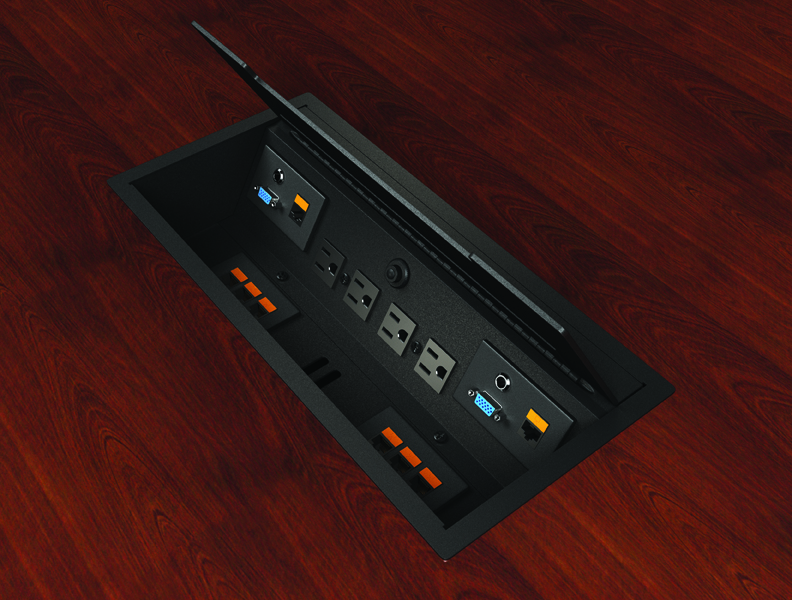 This surface mount or under table mount unit has 1 power receptacles, and 1 RJ45 Cat 6 Data Jacks. When you just need to get cozy - Comfortable, flexible work spaces with soft furniture have replaced conference rooms and desk chairs for connecting and collaboration. PM-Tully tucks right into these comfortable spaces with you. Technology Advanced Conference Tables - TACT Telecom Plates deliver table top access to data, video, audio, and voice in the conference room, training center, or classroom. Technology Advanced Conference Tables - TACT Telecom Plates deliver table top access to data, video, audio, and voice in the conference room, training center, or classroom. The ACT VS is a collaborative video conferencing solution that combines power with the necessary audiovisual components required to foster collaborative meeting environments between teams working together on site or connecting those associates working remotely.